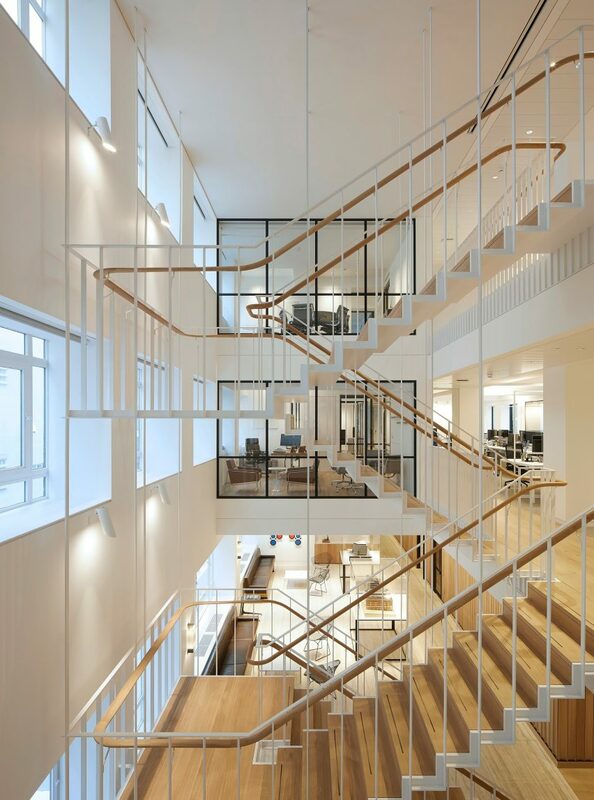 British practice Piercy & Company has cut an atrium through a three-storey officebuilding in London’s Mayfair and suspended a white steel staircase in the void. Savile Row, the Mayfair street renowned for being the home of bespoke tailoring, has been the home of Derwent London for 17 years. The property company commissioned London architects Piercy & Company to refurbish the 1930s art deco building that housed its headquarters. To avoid visually bisecting the newly created atrium, the stairs were engineered from delicate pieces of white-painted steel. The curved oak handrail is vertical in profile on the stair flights, but flattens out at the landings to make them wide enough to lean in, to encourage casual conversation between colleagues. 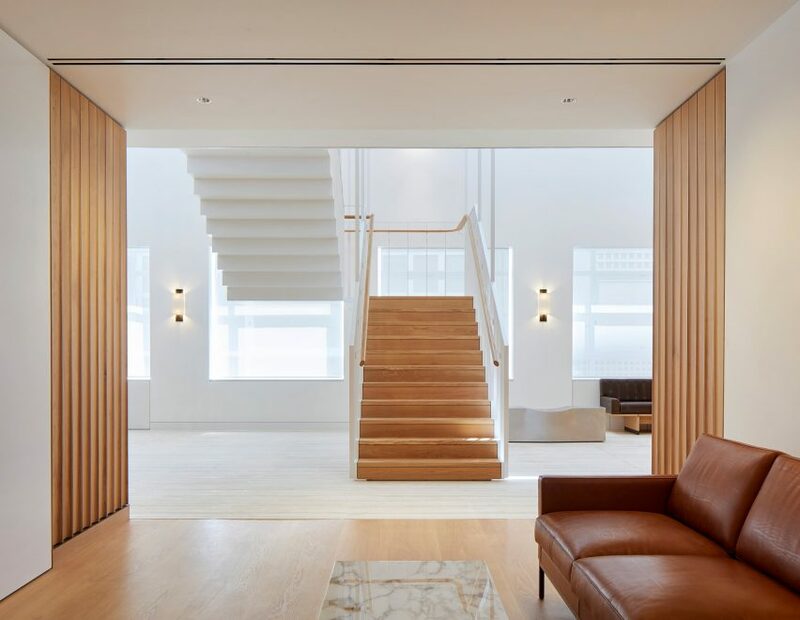 “25 Savile Row is about finding elegance in the relationship of simple forms and natural materials,” said Piercy & Company director Stuart Piercy. The materials chosen have a limited colour palette, the white metalwork and walls accented with oak panelling, stitched brown leather furniture and tan stone. The grid used for the bespoke bronze and glass doors and windows were designed by Piercy & Company to reference the proportions of the original art deco window panes. Each floor has informal spaces for both quiet and collaborative working as well as socialising, including meeting rooms, offices and break out spaces. A glazed extension at first floor level houses a “winter garden”, with tables and chairs for informal meetings. Photographer and filmmaker Nick Ballon documented the makers and materials used in the redesign of the office. Filmed over a year, the Making of 25 Savile Row follows five of the materials selected by the British architects from their workshops to the site. Timber, stone, leather, bronze and steel all feature, intercut with portraits of the makers who work with them. The architect and the clients also star in cameo roles at the end of the film, during a walk-through of the finished project. “I wanted to approach it from a photographic perspective, so using a lot of fixed frames and allowing the action to happen in a controlled composition,” explained Ballon. “I still observed these moments as I would as a photographer, but then we often had to repeat and perform them for the camera in a few takes,” he added. The film takes viewers to Capoferri Serramenti’s workshop in Lombardy, Italy, where the bronze doors were crafted alongside the building’s signage and ironmongery. 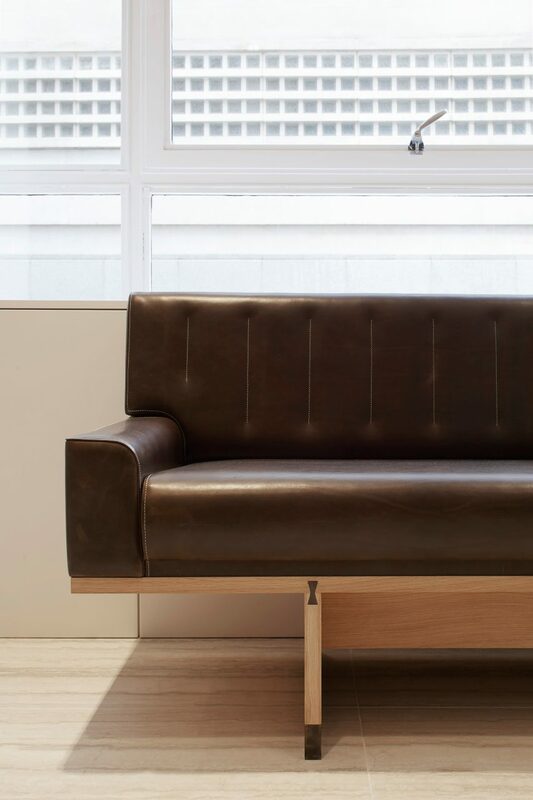 In Kilburn, north west London, Bill Amberg Studio stitched the leather work for the bespoke seating. In the north London workshops of Unique Surfaces artisans milled and tooled Italian travertine stone sourced in Tuscany. Oak wall panelling and joinery came from contemporary furniture makers Benchmarkin Kintbury, Berkshire. In Kent, architectural metalworker Chay Wheeler soldered the suspended steel staircase. “The most challenging aspect of the film was during the editing phase where we had to turn a disjointed narrative into something visually compelling and to take the viewer on the journey that I had been a part of,” said Ballon. Set to a soundtrack of strings, the film lingers on each element and captures the machine and hand work behind the individual materials before they all come together on location. Two years ago Piercy & Company restored another office block in London’s Shoreditch that had been ravaged by fire. Rather than knock the building down, the architects restored the ornate Victorian frontage covering the rear in a bronze facade. Photography by Hufton + Crow.